The Bishop of Wilcannia-Forbes Diocese is mindful of the many farmers in his diocese who are experiencing the worst drought in recorded history. Bishop Columba Macbeth-Green, who grew up on a farm near Forbes, and has personal experience with the effects of drought, understands that it is practical support needed most for those experiencing hardship. “The provision of affordable Catholic schooling should not be an added burden to the financial strain of families, especially for those in need in this time of drought,” he said. Bishop Columba reminds families who are in difficult financial circumstances, for any reason, that they are always able to approach their school Principal to arrange relief in regard to their school fees. Last week Catholics across Australia celebrated St Mary MacKillop’s feast day. Bishop Columba travels widely throughout the diocese just as St Mary did, and just like her, he is well aware of the devastating results drought can have on those whose livelihoods are dependent on rain. 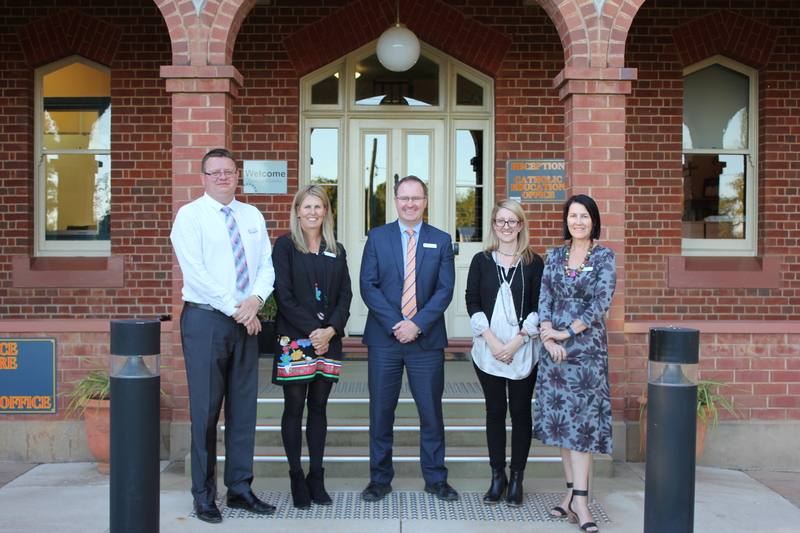 Director of Catholic Education, Mr Anthony Gordon, welcomed four new employees to the Catholic Education Office (CEO) last Monday. Donna Brouff and Katherine Baird bring a wealth of experience to the role of Education Officer which involves directly supporting the work of teachers in schools. Donna will mainly service schools in the north and west of the Diocese such as Bourke and Wilcannia, while Katherine will mainly service schools in the south such as Deniliquin and Balranald. “Accepting these roles are former principals, Mrs Denise Gersbach and Mr Brett Henderson, and we look forward to the wealth of experience in Catholic Education they both bring to these roles,” Mr Gordon said. The ONCE/Compass Specialist facilitates research, planning and support in rolling out a new enterprise student information system in schools. This role will become the champion of change and will be a key influencer for teachers and executive staff. The project aims to deliver a comprehensive information system across the Wilcannia-Forbes Diocese to support reporting and the core business of learning and teaching. Mrs Denise Gersbach, who has been Principal of Holy Family Parish School Parkes for the past 10 years is looking forward to her new role as a ONCE/Compass Specialist and will be based at the CEO in Forbes. Mr Brett Henderson, Principal of St John’s Trangie for the past seven years has accepted the role of System Compliance Specialist which will also be based at the Forbes Office. The System Compliance Specialist role will involve supporting principals and schools in NESA requirements and implementing a new management tool that will streamline the documentation process and assist in school administration and professional learning. “I am looking forward to the challenges this role will bring and it will be great to continue my working relationship with Wilcannia-Forbes Principals,” Mr Henderson said. Mr Gordon said the successful applicants were all selected from strong fields ensuring that educators of the highest standards are joining the CEO Team. He offered a prayer for the new employees – “We pray that the Lord gives you strength, wisdom and fulfillment,” and wished them all the best as they commence their new roles. The Wilcannia-Forbes Catholic Education Office, located in Johnson Street, is one of Forbes’ largest employers, employing up to 40 staff, made up of education professionals, finance professionals, IT professionals, support officers, and administration staff. CEO staff travel large distances to support 18 systemic parish schools in an area covering half of NSW. The office has a state of the art conference centre and holds regular professional development and workshops for principals, teachers and support staff, creating revenue for many Forbes and Parkes small business houses. Wilcannia-Forbes Diocesan Schools will celebrate this year’s Catholic Schools Week with a number of special events starting on Sunday the 4th March. ‘Come and see’ is the theme for Catholic Schools Week which runs from 4 – 10 March 2018. The Open Mornings will be an opportunity for Wilcannia-Forbes schools to open up their ‘classrooms of the future’, and showcase their extensive learning technology tools and student-centred virtual learning spaces. “Our schools enjoy excellent reputations across the diocese and have done for many years. The wonderful sense of community spirit in Wilcannia-Forbes schools is as strong today as it has been any time in our history,” Miss Newell said. “We have many dedicated and skilled teachers who bring out the academic and creative talents in each student through a range of contemporary and diverse learning experiences and programs. The Director of Catholic Education, Mr Anthony Morgan said, “All of our staff are very excited about this event, our students are justifiably proud of their schools and we are looking forward to the opportunity to welcome as many visitors as possible next week. For further information, please contact your local Catholic School. St Patrick’s has raised $205.40 for Catholic Mission. The small school of only students held a Mini-Fete during October which was organised and run by the Primary students. After the Mini-Fete students performed a dance routine for their families and friends, which they had been learning from Miss Kristen from Kristen’s School of Dance, Forbes, who taught the students two dances over three dance workshops. The day was a great success and great fun with the added benefit of raising funds for those less fortunate.